The original and the best, all other brands are substitutes. This ever popular Kilner 1.5 Liter Round Clip Top storage jar has the Kilner brand embossed on the front of the jar and is finished with an orange rubber seal. This jar is perfect for home-canning as well as storing dry food stuffs such as rice, flour, tea and coffee and more. Measuring 9-inches high by 4-1/4 inches wide, this jar is made of high quality glass that is simple to clean for continued use through the years. The original Kilner jar, first invented by John Kilner and Co in the 1840s in England, is as much-loved and successful now as it was 170 years ago. Its long-lasting popularity is owed to its unique pressure seal and iconic design. Put simply, households all over the world trust it to successfully preserve and pickle their fruit and vegetables. A surge in popularity for preserving home-grown fruit and vegetables has catapulted the Kilner jar into the limelight in recent times. Now, not only is the Kilner jar an essential for the kitchen, but has become a statement of style around the home and office. 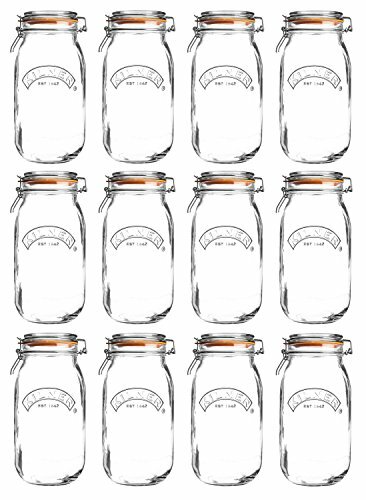 Made in England, Kilner has been successfully canning fruit & vegetables since 1842. If you have any questions about this product by Kilner, contact us by completing and submitting the form below. If you are looking for a specif part number, please include it with your message.